Located on the 2nd floor of a secure stone building, our apartment is comfortably equipped: old parquet floors, cream leather sofas, Italian kitchen with corian plan, nespresso, large shower, desk, new and firm beds, baby equipment on request, plenty of storage, large screen TV, kids toys and books, bike/stroller room. Everything is included: bed linen and towels, final cleaning, Nespresso capsules, spices and groceries, WIFI, phone calls to mobiles and landlines..
No need for a car, everything is within walking distance. Non smoking apartment and pets not allowed. "The apartment is located one street away from the beach, tucked away in a very quiet and nice neighbourhood. The apartment is well-furnished and fully equipped. The owners have thought of everything that one would need when away on a vacation. It made us feel almost as if we were at home. The apartment is extremely clean. The owners are very friendly and forthcoming in helping you out in case you need any assistance, from finding a parking spot to finding the best ice cream place in town, etc. We would definitely recommend this apartment on to anyone considering visiting San Malo, including families with children. Our two kids really enjoyed the stay. " In the heart of historic city, 1 minute walk from 2 beaches. South, north and west windows. 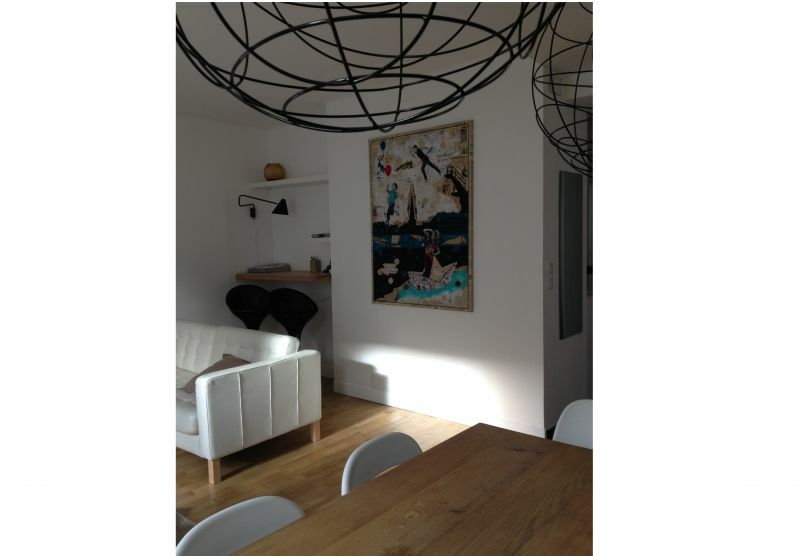 - 2h17 from Paris by LGV train (train station is 2 kilometers from the apartment). 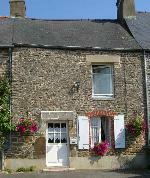 - 13 km from Dinard Pleurtuit airport (flights from London). Put simply, this apartment was absolutely fantastic. I came for a week’s break with my 17 year old daughter and her 2 friends (my wife joined us at the weekend) and we all had a wonderful time. Firstly the location is superb; it’s right in the heart of the bustling, old walled city of St Malo, with all its lovely bars and restaurants, but also just a short walk from the beach and sea-water swimming pool. It was a great base for the 3 teenage girls and myself to explore from and we swam every day. Inside the apartment everything was quite perfect. Very tastefully decorated with plenty of room, the beds were really comfortable, it had a superbly equipped kitchen, with everything you could possibly need, and all very practically arranged. It actually made me re-think our own flat when we returned home! A particularly nice touch was the local recommendations the owner Gaëlle gave in an extremely useful and detailed handbook. But the icing on the cake was that, on arrival, Gaëlle provided local foods for us to try; some crepes with butterscotch sauce, some seafood delicacies and a slab of the wonderful locally made butter. I couldn’t recommend this apartment more highly. Superb apartment, very clean and spacious, with lots of games for children. Ideally placed, 2 steps from the beach, in intramural but quiet. We had a very pleasant stay and were very well received, thanks to Gaëlle! Superbe appartement, très propre et spacieux, avec beaucoup de jeux pour les enfants. Idéalement placé, à 2 pas de la plage, dans intra-muros mais au calme. Nous avons passé un séjour très agréable et avons été très bien accueillis, merci à Gaëlle ! Nous y retournerons. It was the third time we rented this apartment, and we are still very excited. The apartment provides all the needs for a family with children. In addition to the three children's beds, a baby cot is added, baby bath, diaper table, highchair, slabs, etc. The beach is just around the corner, and beach toys (mats, buckets, neat) are offered for use. Well-equipped kitchen, toys and games available. Gaëlle and her family are very helpful and cordial. Det var den tredje gangen vi leide leiligheden, og vi er fortsatt meget enthousiastic om det. It is perfect for a holiday with children. There is a baby-bed, baby-bath, chair and so on. Stranden ligger kun få meter væk, og der er mange strand ting du kan låne. It's impeccably clean and the kitchen is provided with everything you need (delicious butcher, cheese and vegetableshops very nearby). Gaëlle and her family are very helpful and charming. We can only recommend. Het was de derde keer dat we dit appartement huurden, en we zijn nog steeds uitermate enthousiast. Het appartement voorziet in alle behoeften voor een gezin met kinderen. Naast de drie kinderbedden wordt met plezier een babybedje bijgeschoven, een babybad, luiertafel, kinderstoel, slabjes, ... Het strand is maar net om de hoek, en strandspullen (matjes, emmertjes, netjes) worden aangeboden voor gebruik. Goed uitgeruste keuken, speelgoed en spelletjes aanwezig. Gaëlle en haar gezin zijn zeer behulpzaam en hartelijk. It was the third time we rented the appartment, and we are still very enthousiastic about it. It is perfect for a holiday with children. There is a baby-bed, baby-bath, chair and so on. The beach is only a few meters away, and there's a lot of beach stuff you can borrow. It's impeccably clean and the kitchen is provided with everything you need (delicious butcher, cheese and vegetableshops very nearby). Gaëlle and her family are very helpful and charming. We can only recommend. Already 3 stays and the pleasure of feeling like home is always present. Ideal location in Saint Malo intramural. The apartment has all the advantages of a successful stay in two or in family. We will come back again! Thanks to Gaëlle for her warm welcome, her attentiveness and her availability. Déjà 3 séjours et le plaisir de se sentir comme à la maison est toujours présent. Situation idéale dans saint Malo intra-muros. L'appartement dispose de tous les atouts d'un séjours réussi à deux ou en famille. Nous y reviendrons encore! Merci à Gaëlle pour son accueil toujours chaleureux, sa prévenance et sa disponibilité. - Payments by bank transfer. - No hidden fees: final cleaning, bed linen, towels, water and energy are included. days if no loss, theft, damage or smell of tobacco. If necessary, the tenant must pay for the replacement cost of any missing or damaged equipment. - A security deposit of 100 euro is requested before to confirm the option. - Remaining balance is requested at least 1 month before the rental period begins.